The Euro Ceramic range has been specially designed to match up an excellent performance with an attractive price. 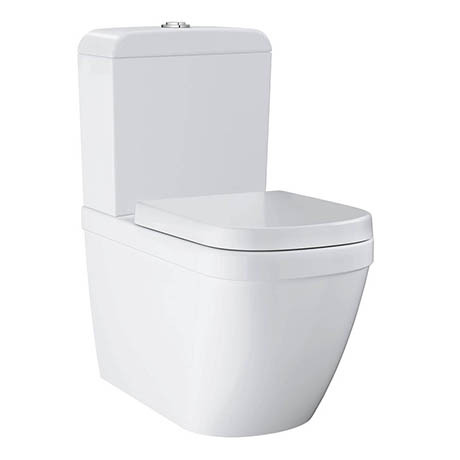 This close coupled toilet features rimless technology, it's easy to clean and there are no corners or crevices, which are playgrounds for bacteria. With Triple Vortex flush, the three water outlets in the bowl create a powerful vortex effect that leaves nothing behind. Every corner of the bowl is covered and cleaned. The cistern is dual flush and includes the cistern fittings and a stylish chrome flush button. Both seat and lid have a gentle and quiet soft-closing mechanism to add a little more comfort. This user-friendly mechanism is durable and reliable making this WC an excellent choice for your project. Dimensions: (H)771 x (W)382 x (D)670mm approx.